A revised version of this translation is available new from Amazon.com (click on image right for details). 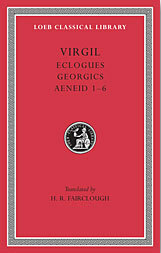 In addition to the translation of Virgil's three poems, the book contains text revisions by G. P. Goold, source Latin texts, Fairclough's footnotes and an index of proper names. These, as well as several other more recent translations and academic commentaries, appear in the booklist (left below). NOTE: I have quoted from the Day-Lewis translation of the Aeneid, rather than this Loeb volume, in the biography pages of Theoi.com. Tell me, O Muse, the cause; wherein thwarted in will or wherefore angered, did the Queen of heaven drive a man, of goodness so wondrous, to traverse so many perils, to face so many toils. Can heavenly spirits cherish resentment so dire? There was an ancient city, the home of Tyrian settlers, Carthage, over against Italy and the Tiber’s mouths afar, rich in wealth and stern in war’s pursuits. This, ‘tis said, Juno loved above all other lands, holding Samos itself less dear. Here was her armour, here her chariot; that here should be the capital of the nations, should the fates perchance allow it, was even then the goddess’s aim and cherished hope. Yet in truth she had heard that a race was springing from Trojan blood, to overthrow some day the Tyrian towers; that from it a people, kings of broad realms and proud in war, should come forth for Libya’s downfall: so rolled the wheel of fate. The daughter of Saturn, fearful of this and mindful of the old war which erstwhile she had fought at Troy for her beloved Argos – not yet, too, had the cause of her wrath and her bitter sorrows faded from her mind: deep in her heart remain the judgment of Paris and the outrage to her slighted beauty, her hatred of the race and the honours paid to ravished Ganymede – inflamed hereby yet more, she tossed on the wide main the Trojan remnant, left by the Greeks and pitiless Achilles, and kept them far from Latium; and many a year they wandered, driven by the fates o’er all the seas. So vast was the effort to found the Roman race. Hardly out of sight of Sicilian land were they spreading their sails seaward, and merrily ploughing the foaming brine with brazen prow, when Juno, nursing an undying wound deep in her heart, spoke thus to herself: “What! I resign my purpose, baffled, and fail to turn from Italy the Teucrian king! The fates, doubtless, forbid me! Had Pallas power to burn up the Argive fleet and sink sailors in the deep, because of one single man’s guilt, and the frenzy of Ajax, son of Oileus? Her own hand hurled from the clouds Jove’s swift flame, scattered their ships, and upheaved the sea in tempest; but him, as with pierced breast he breathed forth flame, she caught in a whirlwind and impaled on a spiky crag. Yet I, who move as queen of gods, at once sister and wife of Jove, with one people am warring these many years. And will any still worship Juno’s godhead or humbly lay sacrifice upon her altars? As he flings forth such words, a gust, shrieking from the North, strikes full on his sail and lifts the waves to heaven. The oars snap, then the prow swings round and gives the broadside to the waves; down in a heap comes a sheer mountain of water. Some of the seamen hang upon the billow’s crest; to others the yawning sea shows ground beneath the waves; the surges seethe with sand. Three ships the South Wind catches and hurls on hidden rocks – rocks the Italians call the Altars, rising amidst the waves, a huge ridge topping the sea. Three the East forces from the deep into shallows and sandbanks, a piteous sight, dashes on shoals and girds with a mound of sand. One, which bore the Lycians and loyal Orontes, before the eyes of Aeneas a mighty toppling wave strikes astern. The helmsman is dashed out and hurled head foremost, but the ship is thrice on the same spot whirled round and round by the wave and engulfed in the sea’s devouring eddy. Here and there are seen swimmers in the vast abyss, with weapons of men, planks, and Trojan treasure amid the waves. Now the stout ship of Ilioneus, now of brave Achates, and that wherein Abas sailed and that of aged Aletes, the storm has mastered; with side joints loosened, all let in the hostile flood and gape at every seam. Thus he speaks, and swifter than his word he clams the swollen seas, puts to flight the gathered clouds, and brings back the sun. Cymothoë and Triton with common effort thrust the ships from the sharp rock; the god himself levers them up with his trident, opens the vast quicksands, allays the flood, and on light wheels glides over the topmost waters. And as, when ofttimes in a great nation tumult has risen, the base rabble rage angrily, and now brands and stones fly, madness lending arms; then, if perchance they set eyes on a man honoured for noble character and service, they are silent and stand by with attentive ears; with speech he sways their passion and soothes their breasts: just so, all the roar of ocean sank, soon as the Sire, looking forth upon the waters and driving under a clear sky, guides his steeds and, flying onward, gives reins to his willing car. The wearied followers of Aeneas strive to run for the nearest shore and turn towards the coast of Libya. There in a deep inlet lies a spot, where an island forms a harbour with the barrier of its side, on which every wave from the main is broken, then parts into receding ripples. On either side loom heavenward huge cliffs and twin peaks, beneath whose crest far and wide is the stillness of sheltered water; above, too, is a background of shimmering woods with an overhanging grove, black with gloomy shade. Under the brow of the fronting cliff is a cave of hanging rocks; within are fresh water and seats in living stone, a haunt of Nymphs. Here no fetters imprison weary ships, no anchor holds them fast with hooked bite. Here, with seven ships mustered from all his fleet. Aeneas takes shelter; and, disembarking with earnest longing for the land, the Trojans gain the welcome beach and stretch their brine-drenched limbs upon the shore. At once Achates struck a spar from flint, caught the fire in leaves, laid dry fuel about, and waved the flame amid the tinder. Then, wearied with their lot, they take out the corn of Ceres, spoiled by the waves, with the tools of Ceres, and prepare to parch the rescued grain in the fire and crush it under the stone. Such words he spoke, while sick with deep distress he feigns hope on his face, and deep in his heart stifles his anguish. The others prepare the spoil, the feast that is to be; they flay the hides from the ribs and lay bare the flesh; some cut it into pieces and impale it, still quivering, on spits; others set cauldrons on the shore and feed them with fire. Then with food they revive their strength, and stretched along the grass take their fill of old wine and fat venison. When hunger was banished by the feast and the board was cleared, in long discourse they yearn for their lost comrades, between hope and fear uncertain whether to deem them still alive, or bearing the final doom and hearing no more when called. More than the rest does loyal Aeneas in silence mourn the loss now of valiant Orontes, now of Amycus, the cruel doom of Lycus, brave Gyas, and brave Cloanthus. Now all was ended, when from the sky’s summit Jupiter looked forth upon the sail-winged sea and outspread lands, the shores and peoples far and wide, and, looking, paused on heaven’s height and cast his eyes on Libya’s realm. And lo! as on such cares he pondered in heart, Venus, saddened and her bright eyes brimming with tears, spoke to him: “You that with eternal sway rule the world of men and gods, and frighten with your bolt, what great crime could my Aeneas – could my Trojans – have wrought against you, to whom, after many disasters borne, the whole world is barred for Italy’s sake? Surely it was your promise that from them some time, as the years rolled on, the Romans were to arise; from them, even from Teucer’s restored line, should come rulers to hold the sea and all lands beneath their sway. What thought, father, ahs turned you? That promise, indeed, was my comfort for Troy’s fall and sad overthrow, when I weighed fate against the fates opposed. Now, though tried by so many disasters, the same fortune dogs them. What end of their toils, great king, do you grant? Antenor could escape the Achaean host, thread safely the Illyrian gulfs and inmost realms of the Liburnians, and pass the springs of Timavus, and whence through nine mouths, with a mountain’s mighty roar, it comes a bursting flood and buries the fields under its sounding sea. Yet here he set Padua’s town, a home for his Teucrians, gave a name to the race, and hung up the arms of Troy; now, settled in tranquil peace, he is at rest. But we, your offspring, to whom you grant the heights of heaven, have lost our ships – O shame unutterable! – and, to appease one angry foe, are betrayed and kept far from Italian shores. And thus is piety honoured? Is this the way you restore us to empire? So speaking, he sends the son of Maia down from heaven, that the land and towers of new-built Carthage may open to greet the Teucrians, and Dido, ignorant of fate, might not bar them from her lands. Through the wide air he flies on the oarage of wings, and speedily alights on the Libyan coasts. At once he does his bidding, and, God willing it, the Phoenicians lay aside their savage thoughts; above all, the queen receives a gentle mind and gracious purpose toward the Teucrians. Then said Venus: “Nay, I claim not such worship. Tyrian maids are wont to wear the quiver, and bind their ankles high with the purple buskin. It is the Punic realm you see, a Tyrian people, and the city of Agenor; but the bordering country is Lybian, a race unconquerable in war. Dido wields the sceptre – Dido, who, fleeing from her brother, came from the city of Tyre. Long would be the tale of wrong, long its winding course – but the main heads of the story I will trace. Her husband was Sychaeus, richest in gold of the Phoenicians, and fondly loved by unhappy Dido; to him her father had given the maiden, yoking her to him in the first bridal auspices. But the kingdom of Tyre was in the hands of her brother Pygmalion, monstrous in crime beyond all others. Between these two came frenzy. The king, impiously before the altars and blinded by lust for gold, strikes down Sychaeus unawares by stealthy blow, without a thought for his sister’s love; and for long he hid the deed, and by many a pretence cunningly cheated the lovesick bride with empty hope. But in her sleep came the very ghost of her unburied husband; raising his pale face in wondrous wise, he lad bare the cruel altars and his breast pierced with steel, unveiling all the secret horror of the house. Then he bids her take speedy flight and leave her country, and to aid her journey brought to light treasures long hidden underground, a mass of gold and silver known to none. Moved by this, Dido made ready her flight and her company. Then all assemble who felt towards the tyrant relentless hatred or keen fear; ships, which by chance were ready, they seize and load with gold; the wealth of grasping Pygmalion is borne overseas, the leader of the enterprise a woman. They came to the place where today you will see the huge walls and rising citadel of new Carthage, and bought ground – Byrsa they called it therefrom – as much as they could encompass by a bull’s hide, and they are choosing laws and magistrates, and an august senate. But who, pray, are you, or from what coasts come, or whither hold you your coarse?” As she questioned thus he replied, sighing and drawing every word deep from his breast. She spoke, and as she turned away, her roseate neck flashed bright. From her head her ambrosial tresses breathed celestial fragrance; down to her feet fell her raiment, and in her step she was revealed a very goddess. He knew her for his mother, and as she fled pursued her with these words: “Why, cruel like others, do you so often mock your son with vain phantoms? Why am I not allowed to clasp hand in hand and hear and utter words unfeigned?” Thus he reproaches her and bends his steps towards the city. But Venus shrouded them, as they went, with dusky air, and enveloped them, goddess as she was, in a thick mantle of cloud, that none might see or touch them, none delay or seek the cause of their coming. She herself through the sky goes her way to Paphos, and joyfully revisits her abode, where the temple and its hundred altars steam with Sabaean incense and are fragrant with garlands ever fresh. Meanwhile they sped on the road where the pathway points. And now they were climbing the hill that looms large over the city and looks down on the confronting towers. Aeneas marvels at the massive buildings, mere huts once; marvels at the gates, the din and paved high-roads. Eagerly the Tyrians press on, some to build walls, to rear the citadel, and roll up stones by hand; some to choose the site for a dwelling and enclose it with a furrow. Here some are digging harbours, here others lay the deep foundations of their theatre and hew out of the cliffs vast columns, fit adornments for the stage to be. Even as bees in early summer, amid flowery fields, ply their task in sunshine, when they lead forth the full-grown young of their race, or pack the fluid honey and strain their cells to bursting with sweet nectar, or receive the burdens of incomers, or in martial array drive from their folds the drones, a lazy herd; all aglow is the work and the fragrant honey is sweet with thyme. “Happy they whose walls already rise!” cries Aeneas, lifting his eyes towards the city roofs. Veiled in a cloud, he enters – wondrous to tell – through their midst, and mingles with the people, seen by none! So he speaks, and feasts his soul on the unsubstantial portraiture, sighing oft, and his face wet with a flood of tears. For he saw how, as they fought round Pergamus, here the Greeks were in rout, the Trojan youth hard on their heels; there fled the Phrygians, plumed Achilles in his chariot pressing them close. Not far away he discerns with tears the snowy-canvassed tents of Rhesus, which, betrayed in their first sleep, the blood-stained son of Tydeus laid waste with many a death, and turned the fiery steeds away to the camp, before they could taste Trojan fodder or drink of Xanthus. Elsewhere Troilus, his armour flung away in flight – unhappy boy, and ill-matched in conflict with Achilles – is carried along by his horses and, fallen backward, clings to the empty car, still clasping the reins; his neck and hair are dragged on the ground, and the dust is scored by his reversed spear. Meanwhile, to the temple of unfriendly Pallas the Trojan women passed along with streaming tresses, and bore the robe, mourning in suppliant guise and beating breasts with hands: with averted face the goddess kept her eyes fast upon the ground. Thrice had Achilles dragged Hector round the walls of Troy and was selling the lifeless body for gold. Then indeed from the bottom of his heart he heaves a deep groan, as the spoils, as the chariot, as the very corpse of his friend meet his gaze, and Priam outstretching weaponless hands. Himself, too, in close combat with the Achaean chiefs, he recognized, and the Eastern ranks, and swarthy Memnon’s armour. Penthesilea in fury leads the crescent-shielded ranks of Amazons and blazes amid her thousands; a golden belt she binds below her naked breast, and, as a warrior queen, dares battle, a maid clashing with men. While these wondrous sights are seen by Dardan Aeneas, while in amazement he hangs rapt in one fixed gaze, the queen, Dido, moved toward the temple, of surpassing beauty, with a vast company of youths thronging round her. Even as on Eurotas’ banks or along the heights of Cythus Diana guides her dancing bands, in whose train a thousand Oreads troop to right and left; she bears a quiver on her shoulder, and as she treads overtops all the goddesses; joys thrill Latona’s silent breast – such was Dido, so moved she joyously through their midst, pressing on the work of her rising kingdom. Then at the door of the goddess, beneath the temple’s central dome, girt with arms and high enthroned, she took her seat. Laws and ordinances she gave to her people; their tasks she adjusted in equal shares or assigned by lot; when suddenly Aeneas sees approaching, in the midst of a great crowd, Antheus and Sergestus and brave Cloanthus with others of the Trojans, whom the black storm had scattered on the sea and driven far away to other coasts. Amazed was he; amazed, too, was Achates, thrilled with joy and fear. They burned with eagerness to clasp hands, but the uncertain event confuses their hearts. They keep hidden, and, clothed in the enfolding cloud, look to see what is their comrade’s fortune, on what shore they leave the fleet, and why they come; for from all the ships chosen men advanced, craving grace, and with loud cries made for the temple. When they had entered, and freedom to speak before the queen was granted, the eldest, Ilioneus, with placid mien thus began: “Queen, to whom Jupiter has granted to found a new city, and to put the curb of justice on haughty tribes, we, unhappy Trojans, tempest-driven over every sea, make our prayer to you: ward off the horror of flames from our ships; spare a pious race, and look more graciously on our fortunes. We have not come to spoil with the sword your Libyan homes or to drive stolen booty to the shore. No such violence is in our hearts, nor have the vanquished such assurance. A place there is, by Greeks named Hesperia, an ancient land, mighty in arms and wealth of soil. There dwelt Oenotrians; now the rumour is that a younger race has called it from their leader’s name, Italy. Hither lay our course . . . [incomplete verse] when, rising with sudden swell, stormy Orion bore us on hidden shoals and with fierce blasts scattered us afar amid pathless rocks and waves of overwhelming surge; hither to your shores have we few drifted. What race of men is this? What land is so barbarous as to allow this custom? We are debarred the welcome of the beach; they stir up wars and forbid us to set foot on the border of their land. If you think light of human kinship and mortal arms, yet look unto gods who will remember right and wrong. A king we had, Aeneas: none more just or dutiful than he, or more renowned in war and arms. If fate still preserves that hero, if he feeds on the air of heaven and lies not yet in the cruel shades, we have no fear, nor would you regret to have taken the first step in the strife of courtesy. In Sicilian regions, too, there are cities and a supply of arms, and a prince of Trojan blood, famed Acestes. Grant us to beach our storm-battered fleet, to fashion planks in the forests and trim oars, so that, if we are granted to find king and comrades and steer our course to Italy, Italy and Latium we may gladly seek; but if our salvation is cut off, if you, noble father of the Trojan people, are the prey of the Libyan gulf, and a nation’s hope no longer lives in Iulus, that we at least may seek the straits of Sicily, whence we came hither, and the homes there ready, and Acestes for our king.” So spoke Ilioneus, and all the sons of Dardanus loudly assent . . . Scarce had he said this, when the encircling cloud suddenly parts and clears into open heaven. Aeneas stood forth, gleaming in the clear light, godlike in face and shoulders; for his mother herself had shed upon her son the beauty of flowing locks, with youth’s ruddy bloom, and on his eyes a joyous luster; even as the beauty which the hand gives to ivory, or when silver or Parian marble is set in yellow gold. Then thus he addresses the queen, and, unforeseen by all, suddenly speaks: “I, whom you seek, am here before you, Aeneas of Troy, snatched from the Libyan waves. O you who alone have pitied Troy’s unutterable woes, you who grant us – the remnant left by the Greeks, now outworn by every mischance of land and sea, and destitute of all – a share in your city and home, to pay you fitting thanks, Dido, is not in our power, nor in theirs who anywhere survive of Trojan race, scattered over the wide world. May the gods, if any divine powers have regard for the good, if there is any justice anywhere – may the gods and the consciousness of right bring you worthy rewards! What happy ages bore you! What glorious parents gave birth to so noble a child? While rivers run to ocean, while on the mountains shadows move over slopes, while heaven feeds the stars, ever shall your honour, your name, and your praises abide, whatever be the lands that summon me!” So saying, he grasps his dear Ilioneus with the right hand, and with the left Serestus; then others, brave Gyas and brave Cloanthus. Thus she speaks, and at once leads Aeneas into the royal house; at once proclaims a sacrifice at the temples of the gods. Meanwhile not less careful is she to send his comrades on the shore twenty bulls, a hundred huge swine with bristling backs, a hundred fatted lambs with their ewes, the joyous gifts of the god [wine of Bacchus] . . . But the palace within is laid out with the splendour of princely pomp, and amid the halls they prepare a banquet. Coverlets there are, skillfully embroidered and of royal purple; on the tables is massive silver plate, and in gold are graven the doughty deeds of her sires, a long, long course of exploits traced through many a hero from the early dawn of the race. Aeneas – for a father’s love did not suffer his heart to rest – speedily sends Achates forward to the ships to carry this news to Ascanius and lead him to the city; in Ascanius all his fond parental care is centred. Presents, too, snatched from the wreck of Ilium, he bids him bring, a mantle stiff with figures wrought in gold, and a veil fringed with yellow acanthus, once worn by Argive Helen when she sailed for Pergamus and her unlawful marriage – she had brought them from Mycenae, the wondrous gift of her mother Leda – the sceptre too, which Ilione, Priam’s eldest daughter, once had borne, a necklace hung with pearls, and a coronet with double circled of jewels and gold. Speeding these commands, Achates bent his way towards the ships. “Son, my strength, my mighty power – O son, who alone scorn the mighty father’s Typhoean darts, to you I flee and suppliant sue your godhead. How your brother Aeneas is tossed on the sea about all coasts by bitter Juno’s hate is known to you, and often have you grieved in our grief. Phoenician Dido now holds him, staying him with soft words, and I dread what may be the outcome of Juno’s hospitality; at such a turning point of fortune she will not be idle. Wherefore I purpose to outwit the queen with guile and encircle her with love’s flame, that so no power may change her, but on my side she may be held fast in strong love for Aeneas. How you can do this take now my thought. The princely boy, my chiefest care, at his dear father’s bidding, makes ready to go to the Sidonian city, bearing gifts that survive the sea and the flames of Troy. Him will I lull to sleep, and on the heights of Cythera or Idalium will hide in my sacred shrine, so that he may by no means learn my wiles or come between to thwart them. For but a single night, feign by craft his form and, boy that you are, don the boy’s familiar face, so that when, in the fullness of her joy, amid the royal feast and the flowing wine, Dido takes you to her bosom, embraces you and imprints sweet kisses, you may breathe into her a hidden fire and beguile her with your poison.” Love obeys his dear mother’s words, lays by his wings, and walks joyously with the step of Iulus. But Venus pours over the limbs of Ascanius the dew of gentle repose and, fondling him in her bosom, uplifts him with divine power to Idalia’s high groves, where soft marjoram enwraps him in flowers and the breath of its sweet shade. And now, obedient to her word and rejoicing in Achates as guide, Cupid went forth, carrying the royal gifts for the Tyrians. As he enters, the queen has already, amid royal hangings, laid herself on a golden couch, and taken her place in their midst. Now father Aeneas, now the Trojan youth gather, and the guests recline on coverlets of purple. Servants pour water on their hands, serve bread from baskets, and bring smooth-shorn napkins. There are fifty serving-maids within, whose task it is to arrange the long feast in order and keep the hearth aglow with fire. A hundred more there are, with as many pages of like age, to load the board with viands and set out the cups. The Tyrians, too, are gathered in throngs throughout the festal halls; summoned to recline on the embroidered couches, they marvel at the gifts of Aeneas, marvel at Iulus, at the god’s glowing looks and well-feigned words, at the robe and the veil, embroidered with saffron acanthus. Above all, the unhappy Phoenician, doomed to impending ruin, cannot satiate her soul, but takes fire as she gazes, thrilled alike by the boy and by the gifts. He, when he has hung in embrace on Aeneas’ neck and satisfied the deluded father’s deep love, goes to the queen. With her eyes, with all her heart she clings to him and repeatedly fondles him in her lap, knowing not, poor Dido, how great a god settles there to her sorrow. But he, mindful of his Acidalian mother, little by little begins to efface Sychaeus, and essays with a living passion to surprise her long-slumbering soul and her heart unused to love.